Tp 79 Hugin at F 8 Barkarby in 1951. 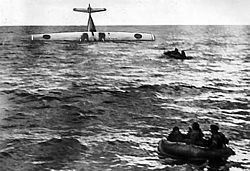 The Catalina shot down by Soviet forces while searching for the missing Hugin. 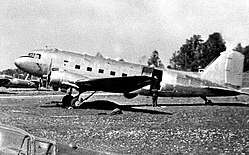 The Catalina affair (Swedish: Catalinaaffären) was a military confrontation and diplomatic crisis in June 1952 between the USSR and Sweden. It was during the Cold War. Soviet fighter aeroplanes shot down two Swedish Air Force aeroplanes over the Baltic Sea. Both aircrafts were found in 2003. ↑ Magnusson 2007, p. 33. ↑ Assumed to be same as origin. This page was last changed on 16 July 2018, at 04:38.